avast! Free Mobile Security – the new anti-theft and anti-malware app from AVAST Software – has been installed by over one million smartphone users in just 16 days. This threshold was crossed on January 6, only 16 days after avast! Free Mobile Security was placed in the official Android Market. avast! Free Mobile Security is a full-featured anti-theft and anti-malware app for Android smartphones. With special “stealth” and remote-access features, it defends smartphone users against the loss or misuse of their device together with anti-malware features to keep online threats at bay. Available through the Android Market and other select markets, avast! Free Mobile Security is completely free. avast! Free Mobile Security was launched in seven languages on the Android Market. The three most selected languages during the download process were French at 15.6%, followed by United States English with 11.5%, and Brazilian Portuguese at 11.4%. “The language division roughly parallels that of our avast! user base for Window PCs. We will be adding more languages as we place avast! Free Mobile Security in other markets around the world,” said Mr. Vlcek. avast! 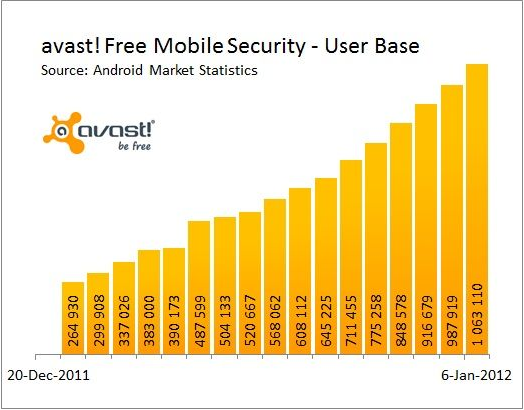 Free Mobile Security is the first app from AVAST Software designed for Android smartphones. The company’s best-known product is avast! Free Antivirus, with over 187 million registered users and available in 39 languages. “Before we launched avast! Free Mobile Security, we knew that only 30% of our users with Android phones had a security program installed on it, but that over 60% would be interested in the feature set provided in avast! Mobile Security. Reaching the million user mark within 16 days shows that we are meeting users’ needs and expectations,” stated Mr. Vlcek.